The lights in the entryway of the small museum my husband and I had entered were dim, but a small spotlight shone down on the presenter and the main exhibit, magnifying and dramatizing the statues behind him and each phrase of his ten-minute welcome. His voice alternated between booms of emphasis to nearly-whispered thoughts designed to leave us pondering. I nodded my head in understanding, furrowed my brow in wonderment, and sighed in astonishment as he described the exhibits we were about to see. We spent nearly two hours in that museum, and I hope the dozen or so notes I made in my journal will trigger my memory with additional details when I recall this visit to friends and family. One comment, however, remains vivid: "History," the presenter said, "is written from the perspective of the one who holds the pen. This museum is our turn to tell our history." YES! I thought. THAT is why I write! To explore my history, to share my perspective, and to choose the pen with which to write. 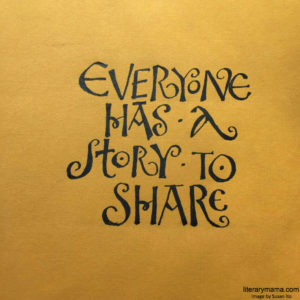 That same sentiment also informs every decision we make at Literary Mama, because we believe every mother has a story worth sharing and because we're committed to sharing those stories. I hope the image on this page, created specifically for us by former Literary Mama editor Susan Ito, encourages you to "hold the pen"--and I hope you'll let us read what you've written. We're particularly interested in pieces for our May and June special issues. Read more details here. Welcome to our March issue. Susan Ito is the author of The Mouse Room and co-editor of the literary anthology A Ghost At Heart’s Edge: Stories & Poems of Adoption). Her work has appeared in Growing Up Asian American, Choice, Literary Mama, The Bellevue Literary Review, Making More Waves and elsewhere. She writes and teaches at the San Francisco Writers’ Grotto, Mills College, and BayPath University.